What is the best dual bank onboard battery charger for a 2006 24v. What quantity and size of batteries? One cranking with 800 cca,1000 mca. One deep cycle with 550 cca,690 mca, 140 rc. I use this one and it's been awesome. I plug the boat in every night when I get home. It sits all winter plugged in. Batteries have been flawless. If you need a quicker charge, they also have a 20A version. We use the ProMariner's on all 3 of our boats between my dad and me (Dual Battery Combo on a Ski Boat, Triple Battery Crank/Dual-House Setup, and a Dual Battery soon to be triple battery on the 22VE (https://www.amazon.com/dp/B00F5EBTGA..._bjpyCbKW6GCA8 )) . It's super versitile, and it adjusts voltages based on which one needs it the most. Also, on the 2-moving-to-3 setup, it allowed me to buy the bigger charger until I needed to leverage the third bank. No issues with them so far. They keep the batteries charged. They charge faster then battery tenders. 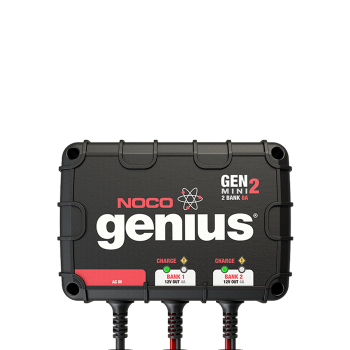 noco genius here too--genM2 8amp. super easy install and works great. they have deals every few months that make it worth going with theirs over a cheaper brand. What ever you do, make sure you get a quality on board charger made for a marine environment. In the bass boat community which i am also part of, charging for starting and trolling motors is taken very seriously especially if you do tournaments. I don't know much about the Noco but i have heard they are good. What you see in most higher end boats is either Dual Pro, or Guest chargers. They do last a long time. I have Guest in my wake boat and dual pro in my bass boat. So far 6 years of service on both and they never miss a beat. You may pay $50 more but its a fully potted changer that handles all marine conditions. I have also heard good stuff about Minn Kota chargers but the one thing with these is their size. They are huge and heavy and take up storage space. My 2 bank guest is about half the size of the Minn Kota and puts out 10amp per bank which is more than the MK. Based on this, I would suggest 20A 2-bank. This gives you a little charging head room. Charger wont work as hard as a smaller charger. One feature I like about most of the promariner models, is their distribute on demand. The charger can dedicate the bulk of its output, to the lowest bank, first. In most boats, this is going to be the house bank. Cranking banks, rarely need much charging, just some maintenance. I obviously get the intent of the battery chargers that people install but I question why sometimes? I have a starting battery and 2 for my stereo. I've had my stereo playing for 6 or so hours while the boat is turned off and never had it die on me. I don't have the biggest stereo out there compared to some and know that draw would make a difference but it seems like regardless of stereo a lot of people end up installing one. Not sure what I'm missing otherwise besides peace of mind? Does the alternator not provide enough power to top them up again once running? That’s what I was thinking. I’ve never actually charged the batteries in my tige. They have gotten low once but after a day on the water they were good again. It would be nice to have so I could run the stereo for hours or something. not typically. If you run your boat for a while then yes the alternator will charge the batteries. But you always want to make sure your batteries are maintained and charged. Weak batteries and leaving batteries in that condition especially in the heat of summer requires you to buy batteries more often. Heat kills batteries. And playing your stereo for 6 hours and then taking a 20 min ride in the boat will probably NOT fully charge your system. Every day when i done on my boat it gets plugged in so the batteries are fully charged for the next day. I usually get 7+ years out of my batteries doing this. A fully charged battery is happy battery. you also have to make sure that all your batteries are being charged by the alternator. In most bass boats, the trolling motors are NOT charged by the motor. Are your stereo batteries also connected to the charging system? An on board charger just makes it easy to plug in so the next day you are ready to go. And like i said, it also extends the life of batteries when used properly. Last edited by bobcat1973; 02-11-2019 at 07:13 PM. Unless you have a long cruise back from where you were sitting back to your trailer/mooring, then no. Your alternator likely hasnt fully charged your batteries. Sulfation is real and will shorten a batteries life. Sulfation gets worse and more permanent as batteries are left stored in a low state of charge and can even increase their natural discharge rate(yes batteries discharge if left untended with zero electrical loads hooked up to them). Over the course of the batteries life it SHOULD last longer if tended when not in use, especially over winter layup. Not like your car that is getting driven daily. Your alternator will not bring those batteries back to full charge unless you drive for quite a long time. You may also be taxing the alternator more than you should be, helping it to die an early death. Even then, the batteries will survive longer if you keep them maintained with a charger. Keeping your batteries permanently at 3/4 charge (or worse) will result in premature battery failure. With a charger, it is not unusual to get several more years of use from your batteries. I have a Minn Kota 3 bank, 45 amp charger. It is a beast, but comes highly recommended on the fishing forums I saw. Be excellent to one another. Yes, alternators make bad battery chargers. Their primary function is to keep up with normal loads, and replenish whats used to crank the engine. 3 batteries and hours of engine off load, is not normal. In most cases, boaters that spend a long time on the hook, have just a short ride back to dock/ramp. So not enough time for an alternator to be effective in this scenario. So having a means to recharge the batteries once the boat is off the water, is most ideal. Its also no good for a battery, to be left depleted. Best to recharge is as soon as possible. The layup maintenance of an on-board charger can prolong battery life. also, keep in mind hooking up a 1 amp charger to your group 31 cells is also NOT good enough. You want a charger with some power. I usually always go 10 amp per bank. Its able to recover batteries that are low on charge and also isn't too much either. I found that 10 amp on deep cycles and full size starting batteries is a great medium to keep them in working condition. A 1 amp charger will struggle getting a depleted battery re-charged. Could take days. 5 amp would be the lowest i would go.